"I love your Dominator. This stuff is the best. I just shot a six point buck with it!" 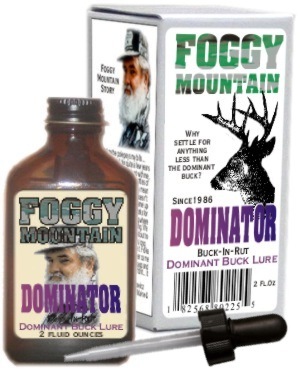 This special blend of Buck in rut urine and gland scents make this the dream potion for mock scrapes. To make sure that you "tick off" the trophy in your hunting area and bring him into your scrape, all of our buck urine is collected from the biggest meanest bucks in our herds. There just isn't anything more life-like than this! When you hold up a bottle, you can almost hear those bucks scrapin' and snortin'! Follow Lure Placement Map. Saturate ScentTags with Buck in a Bottle and hang just above real or mock scrape. Be sure that the lure placement puts the buck in a good position for a clear shot when it stops to investigate. Remember the goal of using Buck in a Bottle is to draw the dominant buck off the game trail into position and distract it long enough for you to have a good shot. Bring your ScentTags in at night. You only want to attract the buck when you are there to hunt. Ideal Usage: During rut, while rattling, with mock scrapes. GUARANTEE: If you are unsatisfied with the quality of this product, send back the unused portion, sales slip and reason for returning to the address below for a full refund.